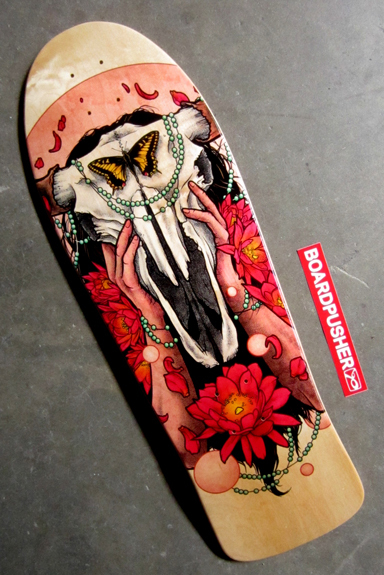 Today’s BoardPusher.com Featured Deck was designed by Nick Evans for a Colorado Shred Ladies fund raising event. Find out more about the Colorado Shred Ladies by following them on Instagram @co_shredladies and follow Nick @tothemoonstudios or check out his website at tothemoonstudios.com. 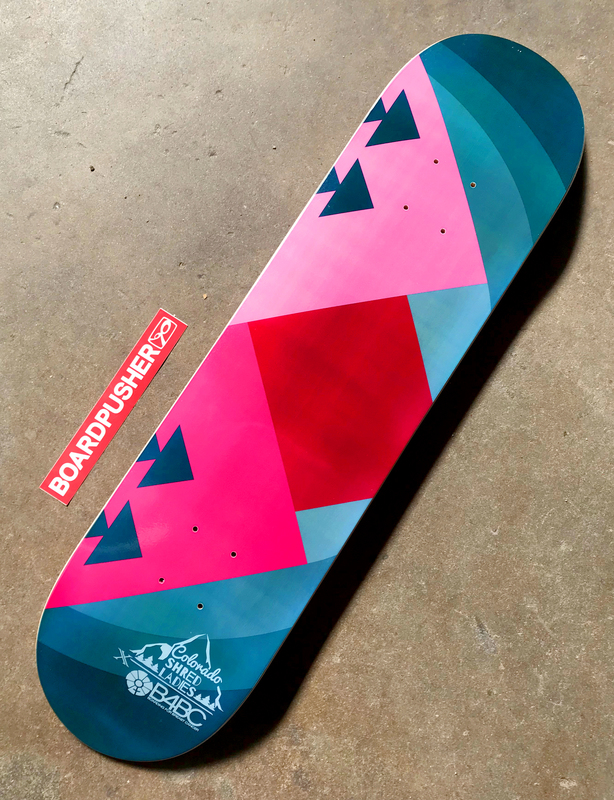 Create a custom skateboard design for your upcoming events at BoardPusher.com. This week’s BoardPusher.com Featured Deck comes to us from adventure lifestyle and commercial photographer Jon Paciaroni. The graphic was created using “a 9 shot panoramic stitch of a storm passing over Wolf Creek Pass in Southern Colorado.” You can find Jon’s portfolio, projects, and prints at jonpaciaroni.com. 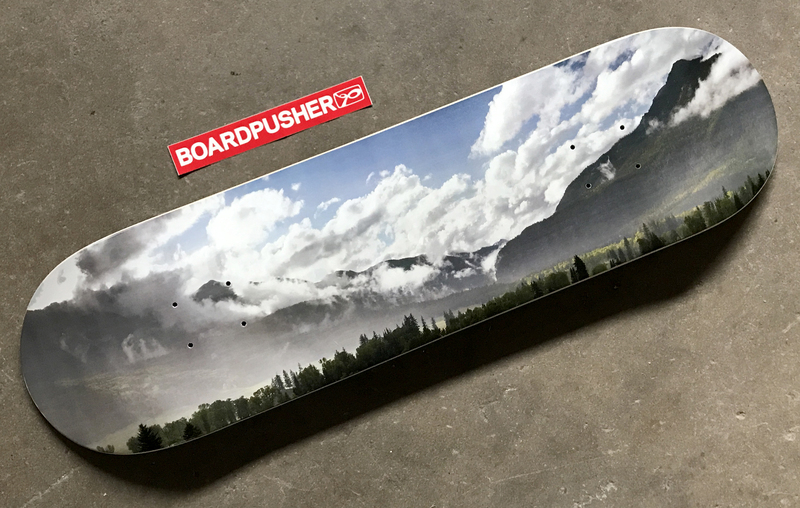 Whether you’re a professional or just pointing and shooting with your phone, you can create a skateboard graphic with your photos at BoardPusher.com. We get spoiled by picturesque moments like this in Colorado all the time and Jimmy Bryant has incorporated his style into a CO sunset for this week’s BoardPusher.com Featured Deck. You can explore Jimmy’s extensive portfolio at atomicchild.com. 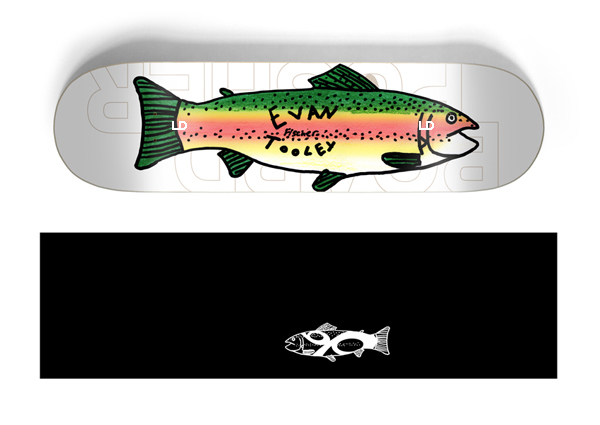 Represent your local pride by designing a a custom skateboard graphic inspired by your region on BoardPusher.com. For this week’s Featured Deck we have an old school board with a graphic designed by Matt Verges. “Buffalo Girl” is just an example of Matt’s style of melding skulls, gore, etc. with beauty. Find out more about Matt and take a look at his artwork at Matt-Verges.com. Matt was also the last THI3D THURSDAY design contest winner. Check out his winning design “Heavy Lies the Crown” here. 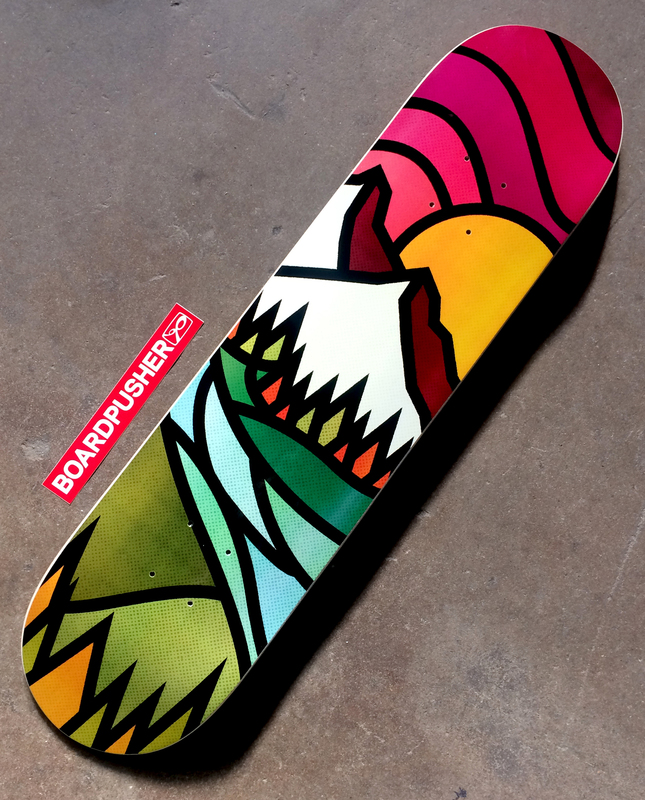 With several different shapes on BoardPusher.com there is sure to be a deck that fits your style. Try designing your own old school board now. 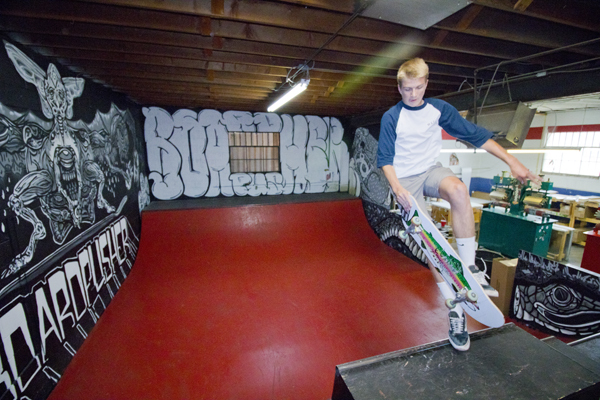 We’ve known Evan since he was a little tyke so we were excited to help him create his latest skateboard design. Evan also added “LD” to go under the trucks on his graphic. “The LD is something that I’ve always done. It stands for ‘Lock Down’. When I was competing a lot back in the day I would only go with tricks I had on lock down, hence the LD.” Evan added the LD using the font generator on the BoardPusher.com skateboard designer after uploading his finished graphic. You can check out that process in the quick video below. It really is simple for anyone to create his or her own skateboard graphic with just about any tools you may have. Give it a try on BoardPusher.com. Last year, the BoardPusher crew designed a few skateboards, packed up some camping gear, and loaded a couple of trucks ready to head through the mountains of Colorado. Unfortunately, the Rocky Mountain weather wasn’t cooperating. 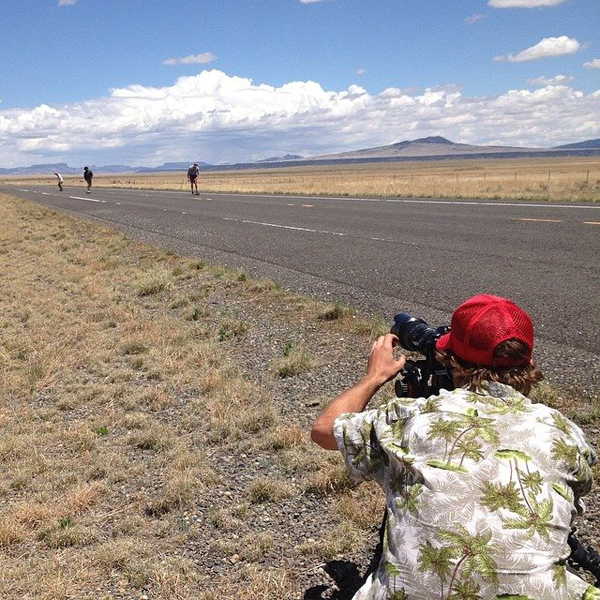 As we scrambled to put together a new route, we set our sights on a much clearer and dryer path to El Paso, Texas. We had our good buddy and filmer Nathan Minatta of Skeptic Productions along for the ride and here’s what was captured. BoardPusher.com team riders Levi Huffman and Mitch Schmidt made the trek up to the Woodward Camp in Copper not too long ago. They can be seen among a host of other skateboarders in this edit from Woodward Copper. When we first met Lee Wilson, he was just a teenage skate runt hustling people for rides to any and all skateparks in Colorado. 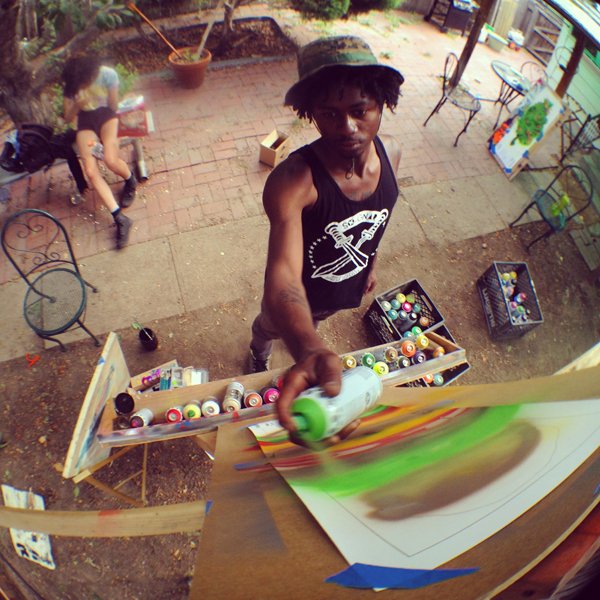 Now, Lee is one of the most recognized figures in the Denver skate scene. From charging hips for big 360 melons to hurling himself down big stair sets, it’s common for Lee to garner a crowd as soon as he sets his sights on his next trick. 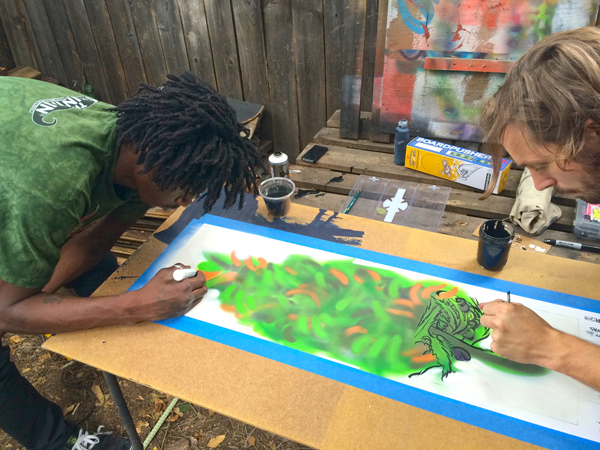 Tasked with the mighty feat of getting Lee to stop skating for any amount of time, we pulled him from one of his favorite spots, brought him over to our Art Director’s backyard studio, strapped Lee with some spray paint and art supplies, and let him loose on a few DIY canvases. We also chatted with Lee about his skateboarding style, the design concept, and contents of the Denver Lunchbox. 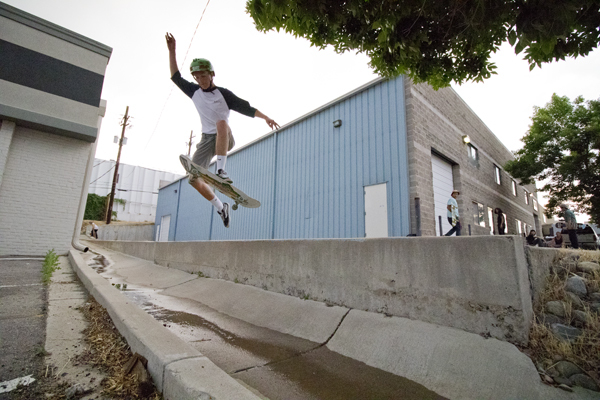 Like most true street skateboarders in Denver, Lee spends a lot of time on East Colfax searching for stair sets and gaps. Oh yeah, the 40oz deck, can you skate hungover? Pick up one of Lee’s hand designed Denver Lunchbox decks here and check out a clip of Lee and the rest of the BoardPusher.com team skating here. You can create your own custom skateboards at BoardPusher.com. I’ll be building xgames this year hmu! 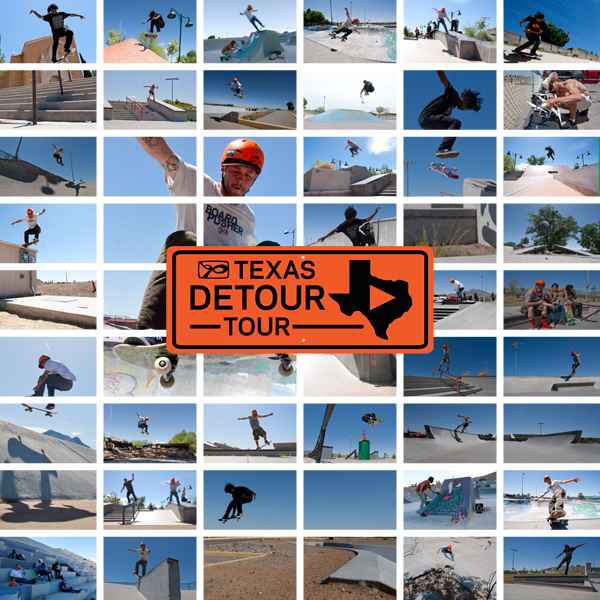 Not too long ago, BoardPusher.com set across the Southwest with team riders Levi Huffman, Mitch Schmidt, and Lee Wilson with Nathan Minatta of Skeptic Productions along for the ride to capture the road life. We hit up skateparks, street spots, and got in some ditch skating as well as other good times from Colorado Springs down to Albuquerque and back. Nathan put together 4 sick edits with music from DJ Largechild and you can check out the entire journey below. On Go Skateboarding Day BoardPusher.com set up a couple of art walls made from broken skateboards at some parks in the greater Denver area. 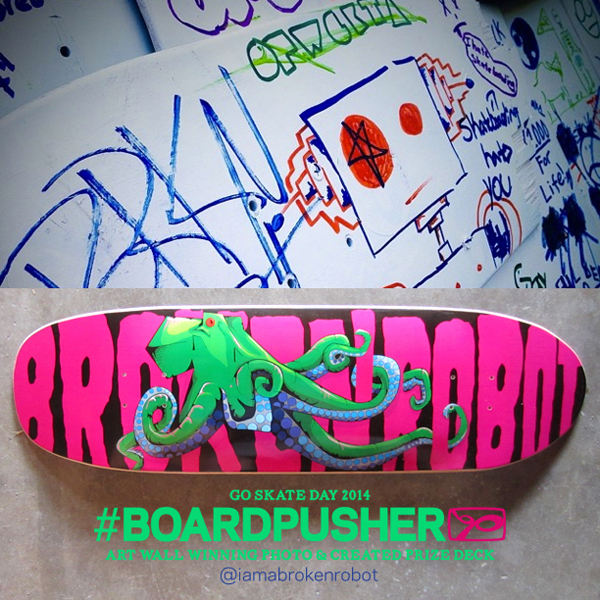 We asked skaters at the parks to contribute to the art wall, take a photo of it, and tag it with #BoardPusher on Instagram for their chance to win a free skateboard deck. Congratulations to Jonny T. Neely (@iamabrokenrobot) whose photo was picked as the winner. Here’s the deck he designed as well. Jonny is also an artist and you can see more of his work at http://www.jonnytneely.com.